On day one, she made the rye sourdough starter and left it to ferment. On day two, it was fed more flour and water. And on day three, and on day four, and on and on until it was ready to bake with. Phew! It is amazing that some people use sourdough starters that they received from their mother, who got theirs from their mother… this jar of goo being 50 years old or more. This is the beginning of my journey into bread. Now I have this jar of living bubbly creatures that I feel guilty about when I forget to feed. Bread is alive. And learning how to make it properly, well, for me it’s kind of a spiritual experience. Even wikipedia gets all mystical if you type in the one short word: bread. I’m a noob. Such a noob. The picture above is of my very second pain au levain. As in, rustic bread made without yeast from a jar or a packet. Bread made the way people have been making bread for a really long time. The first loaf I threw away. Sniff. It didn’t rise much. That is a kind way to describe the very heavy lump of cement that I pulled from the oven. And I knew, I knew, it wasn’t going work. Still I baked it anyway. This second loaf I kept! The crust was a bit thick, but it was ok. Not good, but ok. The oven was too hot and I didn’t have enough steam. But it was edible, satisfying and FLAVORFUL. The flavor amazed me. And it made heavenly canapes and grilled cheese sandwiches. I know I’m on the road to success. 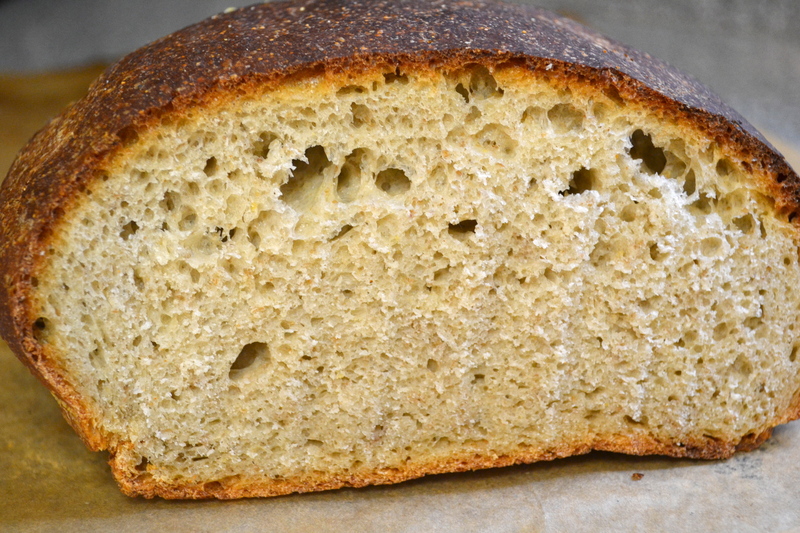 Bread made from the wild yeast that is just in the air or on the grains of wheat themselves. It just takes time, sooo much time, patience and meticulousness. Flour, temperature, folding, heat, steam, time to rise and develop flavor… the process just amazes me and enriches my day. I’ve bought some books to read, and quite heavy tomes they are. But I give a lot of cred to the fresh loaf blog and weekend bakery for so much guidance. What a world there is out there to discover. And my humble noob sourdough? My recipe made two loaves this size and they’re almost all gone. 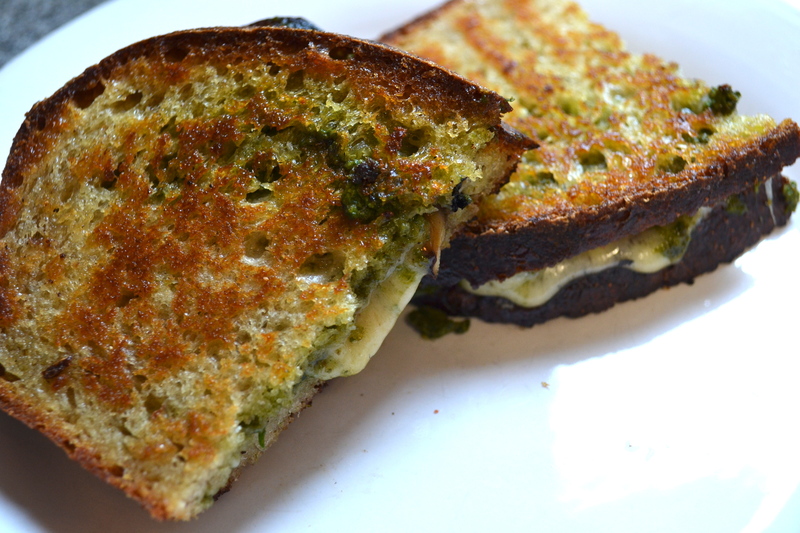 We ate them with a cream cheese and horseradish spread with carrot; drizzled with olive oil and topped with manchego and slices of tomato; made into some yummy grilled cheese sandwiches such as gruyere, mushroom and pesto (see below) and mature cheddar, spinach and fresh jalapeno. Yum. Here is a recipe for a rye sourdough starter from the weekend bakery. If you’re interested, start it now because it won’t be ready for at least five days! There are other starter recipes, depending on what kind of bread you want. For any old hats at bread baking who might perchance be reading my first few baby steps, send me some tips! I’m completely afraid of baking bread – especially since mine has to be gluten-free! Maybe someday I’ll be brave enough… 🙂 Your bread looks delicious! Gluten-free bread is tricky! I think gluten-free flatbreads like chapatis with gram/besan flour are pretty good and not too hard to make. On the plus side for those who are limiting but not completely cutting out gluten from their diet, whole rye and pumpernickel breads are very low in gluten. Thank you for this post. I’ve just begun my journey into the world of sourdough and, so far, with mediocre success. My starter is looking good but I actually cheated on my first loaf (adding yeast), feeling that it was more important for me to keep my morale high than stick to tradition. I’m going to try again today! Your loaf and grilled cheese look great!